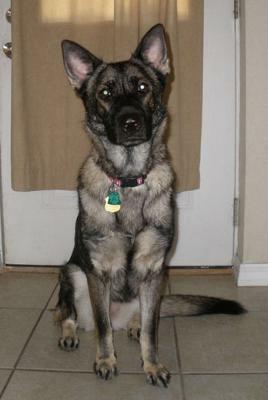 This is our lovely two year old German Shepherd girl Duchess. She's a pampered pooch that loves to go for car rides every chance she gets. Her hobbies include catching frisbees and herding everything in sight. She's attempted to herd everyone from the house cat to the horses and ferrets, though they mostly tend to ignore her completely. She's a wonderful guard dog and tries desperately to be our little lap dog despite her size.